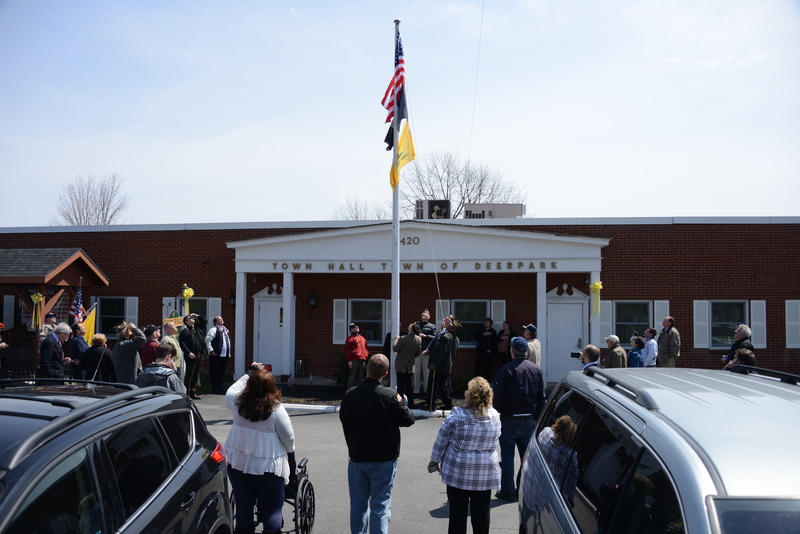 About an hour and a half from New Rochelle, in the quiet Town of Deerpark,NY, Veterans,Town Officials and citizens of Huguenot, New York and New Rochelle joined ranks to salute the hoisting of the historic American flag known as the “Gadsden Flag”. As New Rochelle City Council condemns local Veterans groups about the “appropriateness” of this flag, Deerpark Town Supervisor, Karl A. Brabenec understands all too well just how appropriate this symbol of American history is. Karl, along with Deerpark Councilman David Dean and Orange County Legislator, Dennis Simmons spoke eloquently among a crowd of WWII, Korea, Viet Nam and Desert Storm era Veterans about the importance of honoring our military history. “This flag should not offend anybody” said Brabenec, a first generation American whose parents and grandparents lived through Nazi Germany and Communism in Eastern Europe before making their way to the United States to provide a better life for their family. Brabenec’s father went on to serve in the U.S. Navy. Army /Air National Guard Veteran and Orange County Legislator, Dennis W.Simmons standing in front of their 9/11 Memorial, spoke in disbelief out how the Gadsden (which was Commissioned as an official Navy Jack on September 11th, 2002) can fly from any Naval ship but not in front of the Naval Armory in New Rochelle. With words of appreciation and thanks to the Deerpark assembly Assemblyman Ron Tocci presented the Town with a Gadsden flag to hoist in memory of those who have sacrificed and honor those who have made this Country what it is. He also drew the connection between the founding of New Rochelle by the Huguenots and the fact that the Deerpark Town Hall is situated in the Hamlet of Huguenot. Closing comments by Town Councilman David Dean, also a Veteran, welcomed all to Deerpark where “we’re free men and women here and we believe in the sanctity of this flag and it’s a shame it was stricken from the town of New Rochelle Armory” . Well said Councilman. The crowd then gathered around the flagpole as the flag was prepared with the assistance of New Rochelle’s own Veterans James Murphy, Jim Lasser and James Tudy. A solo voice carried through the breeze with a rendition of God Bless America, and for that moment, the voice, the wind and the flap of the flags carried with it the souls of all those who came before us to make this moment possible. These are the times when Americans stand strongest. Rallied around our history and foundation. Thank You Deerpark, Huguenot, and of course our Veterans. God Bless America.